As one of the most popular destinations in the world, Hawaii gets a great deal of attention from visitors from both the mainland United States and the rest of the globe. With its mild climate, beautiful beaches, exotic rain forests, and the aloha spirit displayed by the locals, Hawaii is a dream vacation for almost anyone. When most people think of Hawaii they tend to think of Honolulu, famous for Waikiki Beach and located on the island of Oahu. As the most populous island and with direct flights from many US cities, Honolulu tends to get more visitors than the neighbor islands. However, each of the islands in the Hawaiian chain offers its own unique landscapes and fantastically fun adventures for all. If you’d like to venture away from the hustle and bustle of Hawaii’s largest city and its most densely populated island, consider some of these hotels on Maui and hotels on the Big Island and truly get away from it all during your visit to the Aloha State. 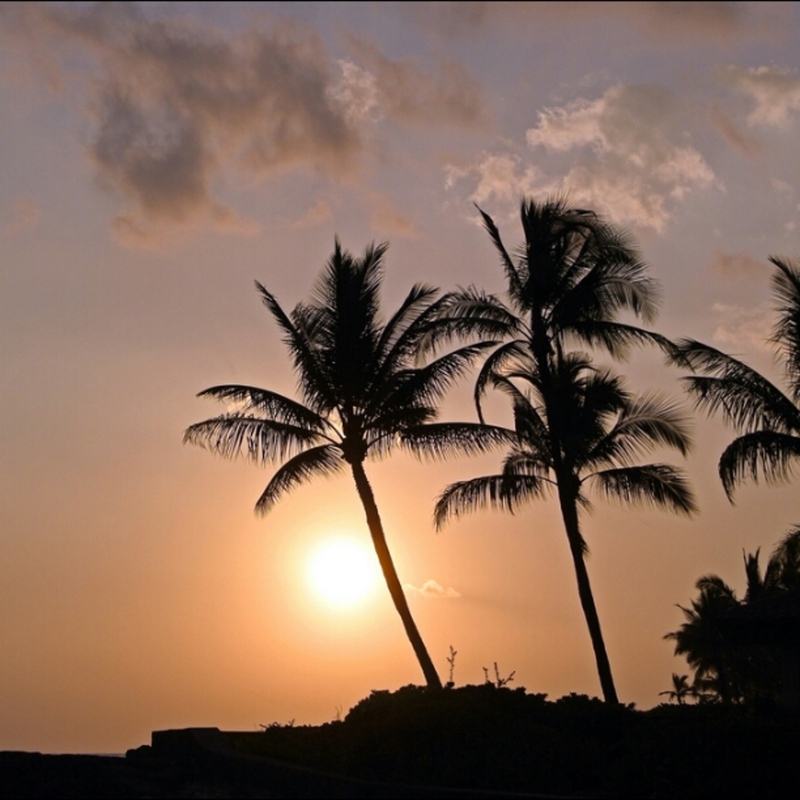 Located on the west side of the Big Island, Kailua Kona is home to the Ironman World Championship and some of the most beautiful beaches in the state. Surrounded by vast lava fields Kailua Kona is a charming little town and is the perfect locale from which to explore the rest of the leeward coast. Uncle Billy’s Kona Bay Hotel is recently remodeled and is located just steps from Ali’i Drive where you’ll find shops and restaurants galore. Be sure to visit their poolside bar for a tropical concoction and great people watching. Be sure to upload your great Instagram photos using the hotel’s free wifi. Located a few blocks mauka (toward the mountains in Hawaiian) of Ali’i Drive is Kona Hawaii Guesthouse. A quaint property reminiscent of a bed and breakfast, Kona Hawaii Guesthouse offers free wifi and is within walking distance of Magic Sands Beach and the Holualoa Gallery. For a small fee this hotel offers free airport pickup for all guests. For a touch of luxury and a truly Hawaiian themed resort, try the Wyndham Royal Sea Cliff, located a mile and a half south of Kona town. This property offers sweeping views of the Pacific Ocean and gorgeous grounds that practically beg for a sunset stroll. This hotel offers condo style rooms with one or two bedrooms and kitchenettes. The rooms all feature free wifi and balconies, some with ocean views. It is possible to walk to Kona from this resort, but a car is recommended to fully explore the area. Located on Maui, also called the Valley Isle, is the Luana Kai Resort in Kihei. Located directly in front of Waipuilani Park and the magnificent Pacific Ocean, Luana Kai and its condo style rooms make for the perfect stay on the southwestern shores of Maui. Take advantage of the property’s pool and tennis courts, and be sure to ask the helpful staff about local activities. And remember that November through March is whale season, and sometimes you’ll be able to see a magnificent humpback breaching right from the hotel grounds. As an adults only, LGBT friendly resort, the Maui Sunseeker LGBT Resort in Kihei is the perfect locale for those who enjoy a relaxed vibe in a beautiful setting. The rooms here offer mini fridges and microwaves, as well as free wifi. Take advantage of the clothing optional pool, and the clothing optional sundeck on the roof. The surrounding area offers many dining and shopping options, as well. This is a sponsored post and is part of Hipmunk’s boutique hotel campaign. All written content is my own. The years that I spent living in Hawaii were some of the best of my life for many reasons. I loved the weather, the people were warm and incredibly resilient, and the mash-up of ethnicities made for some absolutely delectable food. Given the chance I could have lived on kalua pig and huli huli chicken for the rest of my life. Hawaiians also appreciate sweets, and perhaps the best known of these is shave ice. Similar to a snow cone –but don’t ever call it that in Hawaii– shave ice is the most delicious and most satisfying treat in the world, in my opinion. But how can I be wrong? Even the president of the United States is a fan, as is evident in the many photos of he and his family slurping up the icy goodness on their yearly vacations to the Aloha State. If you’re visiting the Valley Isle, otherwise known as Maui, these are the best places to try shave ice, and some flavor combinations that are sure to please, as well as a few hotels in Lahaina that will put you in close proximity. 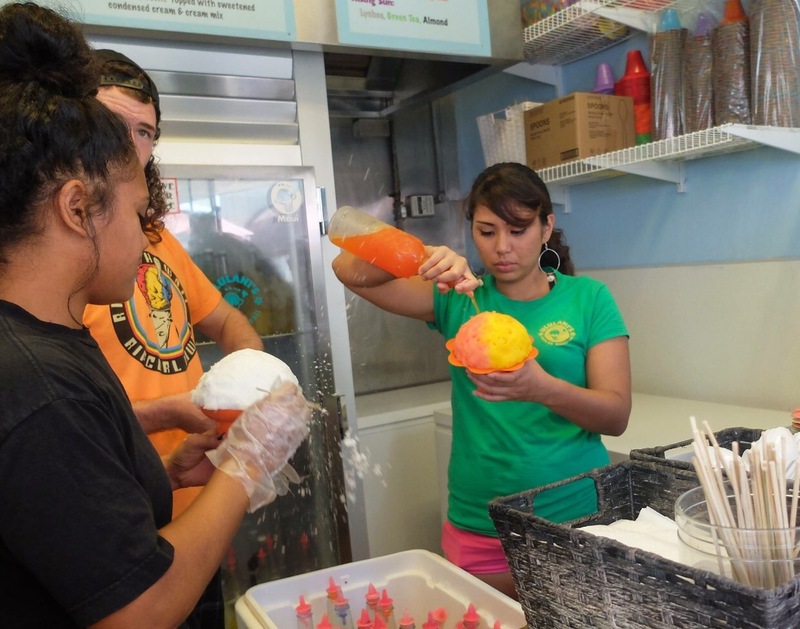 Easily the best known of all the shave ice on Maui, Ululani’s Shave Ice has several locations around the island. If you’re staying at the nearby Lahaina Bungalow you’re just a few steps away from shave ice heaven. You can choose up to three flavor combinations at Ululani’s, and all of their syrups are made from real fruit. Try one of the local favorites like guava, passion fruit, or pineapple, or mix all three. You can also choose to have vanilla ice cream at the base of the ice, or condensed milk doused over the top. Either way, you’ll join the ranks of all of the others who believe Ululani’s has the best shave ice in town. With two locations in Lahaina and Kihei, Local Boys Shave Ice boasts the largest selection of flavors in the state. 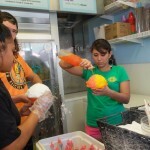 As is the standard, you can choose up to three flavors for your shave ice, and they come in three sizes. Try one of the more exotic local flavors like li hing mui, which is a sweet and salty plum flavor that has its roots in Hawaii’s Chinese culture. You can also try the famous Tiger’s Blood, which is generally a combination of strawberry and coconut, but sometimes you’ll get a hint of watermelon as well. Local Boys also offers free extras when they’re available, like gummi bears and licorice, or you can try azuki bean which is a sweet red bean that is wildly popular in Asia. If you’re staying at the Lahaina Inn you’ll be just steps away from Local Boys, so visit several times to try as many of their flavor combinations as you can. One of the best parts of traveling is the food, as it’s always a great way to get an insight into an area’s cultures and traditions. When you visit Maui be sure to put shave ice on your to-do list; you’ll be delighted that you did. Disclosure: This is a sponsored post and is part of the #HipmunkCityLove campaign. All opinions are my own.